Traditional European styling combines comfortable one-piece handles and big brass, detachable, sprinkling roses. All these cans are hot-dipped by hand in molten zinc-then powder coated in colors or left plain, for many years of gardening pleasure. 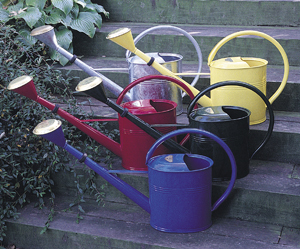 Nicely balanced handles let you water comfortably from any position.